Children need schools that foster learning. Our designs create healthy, flexible, and sustainable spaces so students can focus on receiving the education they deserve. From preschools to high schools, to specialty education centers, we work with each district to create spaces that serve students and their communities. TowerPinkster has developed a unique process that is easy to engage and has proven to be very successful. Our process involves establishing a work plan (plan your work, then work your plan) and timeline at the very beginning of the process. By establishing all of the steps, goals and milestone dates, there will be a much higher comfort level and consistent approach to follow. Using this approach, we have been successful in passing bond issues in over 85% of our districts in the last ten years. 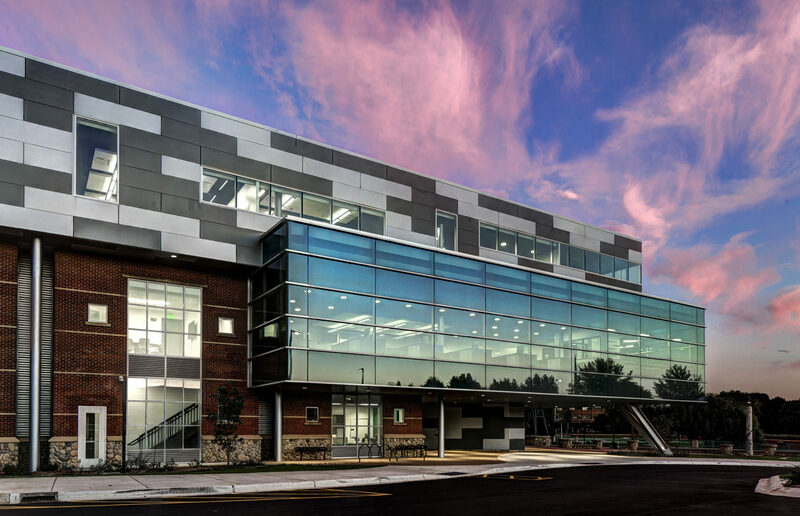 This renovation of the former Kellogg Cereal City Museum is now home to high school STEM education programs for exceptionally talented students. TowerPinkster’s design used biological science for inspiration. Scientific installations including sustainability monitors tied to building systems, suspended molecular models, interactive technology exhibits, and the students’ solar car project enhance the interior space. A facility assessment showed that removing the older, poorly functioning areas in the center, and replacing with a new, two-story academic addition, would be the most economical solution. 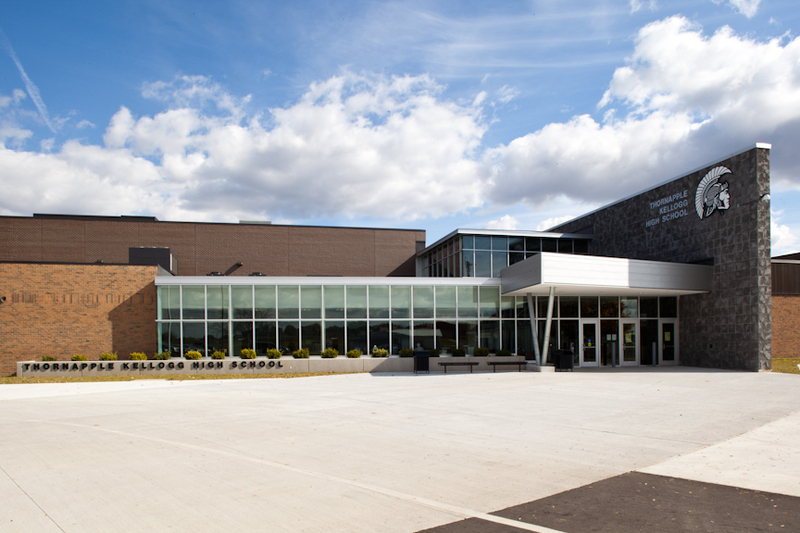 The new building features new science and computer labs, pool and fitness center, cafeteria, and locker commons. 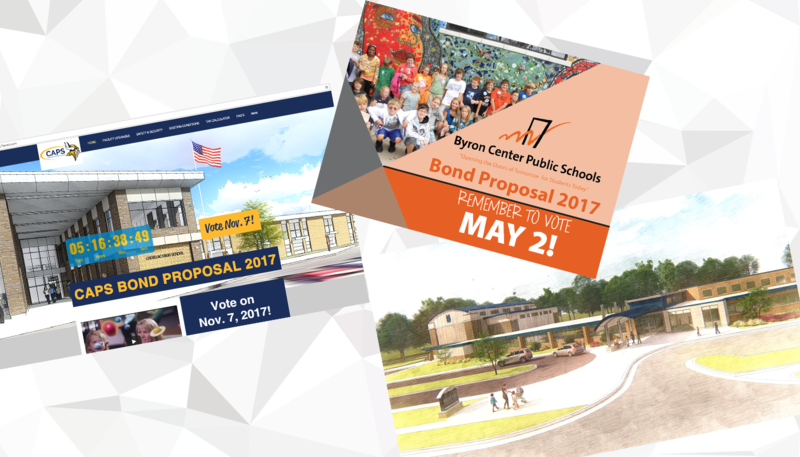 Byron Center High School has been growing at an exponential rate and needed to expand their space to add classrooms, labs, and areas for improved circulation. Originally constructed in 1923, Houseman Field was in need of improved functionality, safety, and accessibility and restoration of the historic facility. The design features home and visitor plazas with handicap-accessible, family-friendly restrooms, ticket kiosks, modern concession stands, new locker rooms, two spectator viewing/event decks, as well as basketball courts, a playground and open space. The new special education building provides unique resources for individuals with autism and severe cognitive and physical impairments. With careful thought to mobility challenges, color, lighting, custom learning spaces, and safety, this school creates an environment that fosters educational exploration within “learning villages.” Students progress from individual classroom learning to a common village and a “main street” that prepare them to transition into their communities. 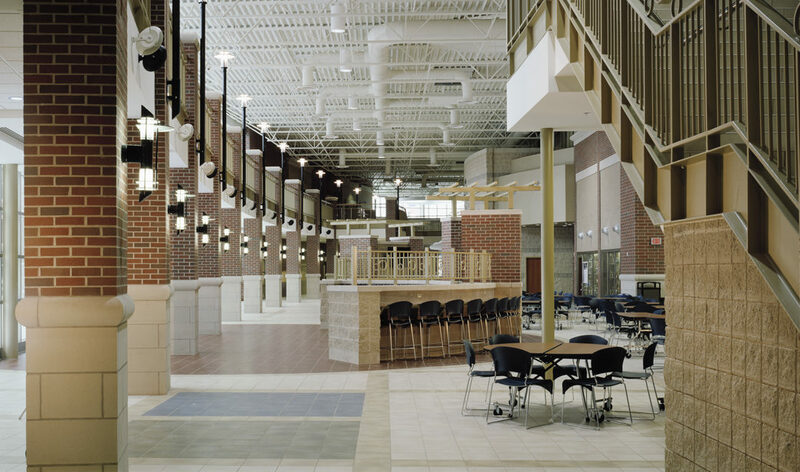 TowerPinkster reduced the scale of a large, intimidating middle school by designing a series of “houses” which include four general classrooms, large and smaller group spaces, science lab, lockers, restrooms, and teacher workspaces. A central student mall provides a physical and visual connection between floors and supports social interaction and impromptu learning. Other features include cafe/auditorium with outdoor seating, media center with tiered computer lab, and a green roof. One of the goals of this project was to provide for greater community use of the building during and after school. TowerPinkster’s solution created two wings that separate educational use and community use spaces. The first wing houses cafeteria, gymnasium, music room, computer lab, and media center space. The second wing features classrooms with mudrooms and locker commons as well as small and large group learning spaces. 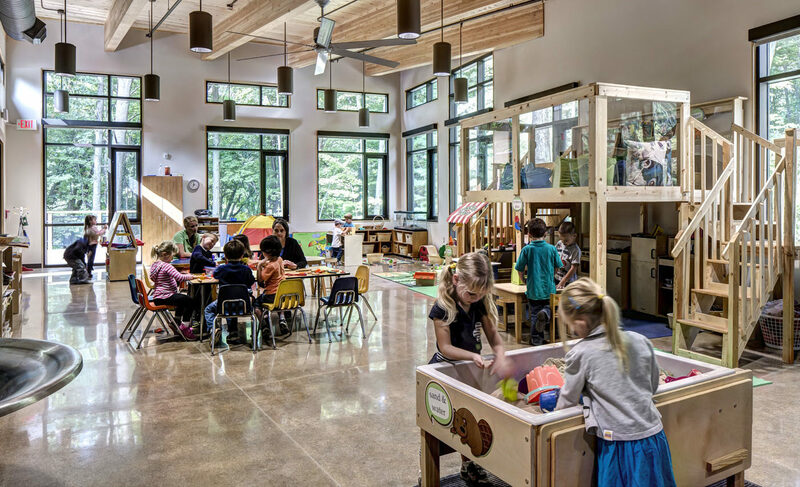 As part of Nature's Way Preschool's “No Child Left Inside” campaign, this new building will replace the current facility, allowing the Nature-Based Learning program to expand and remain one of the most established nature preschools in the nation. The design blends the indoors with the outdoors and offers students the opportunity to interact with nature in a highly immersive learning environment. This new addition opens into a student commons featuring two clearly-defined entrances - one for visitors and students arriving by bus, and the other for staff and students arriving by car. Accordingly, bus, car, and pedestrian circulation zones have been reorganized for safety and security. Features of the new 2-story academic addition also include offices, a new auditorium, woodshop, kitchen and cafeteria, locker commons, science and computer labs, and new classrooms with shared learning space. Innovation High School is part of The New Tech Network of schools. This non-profit organization works with the local school to provide innovative learning environments. The project-based approach engages students with dynamic, rigorous curriculum. The final solution features a new canopy entrance/reception area providing a dramatic image for the program along with a secure and supervised entrance. A centrally located office suite creates a welcoming first impression as well as a safer and more secure environment. The office area has the flexibility to feel open or closed with the use of sliding glass walls. This new building houses both the Early Childhood Center and the Spanish Immersion program, and offer both room for growth. The programming of the space was done in collaboration with the staff and community, in order to form an end result that will meet the long-term needs of the community. The space offers flexible learning environments to accommodate diverse learning styles and methods. TowerPinkster’s team designed several additions and renovations to serve students at all levels. A new main entrance offers added security while creating an identifiable and memorable experience that helps transform the image of the school. The existing natatorium space was transformed into a second gymnasium, and several classrooms feature the addition of open, collaborative project areas. TowerPinkster designed a new stadium entry, team rooms, and press box. 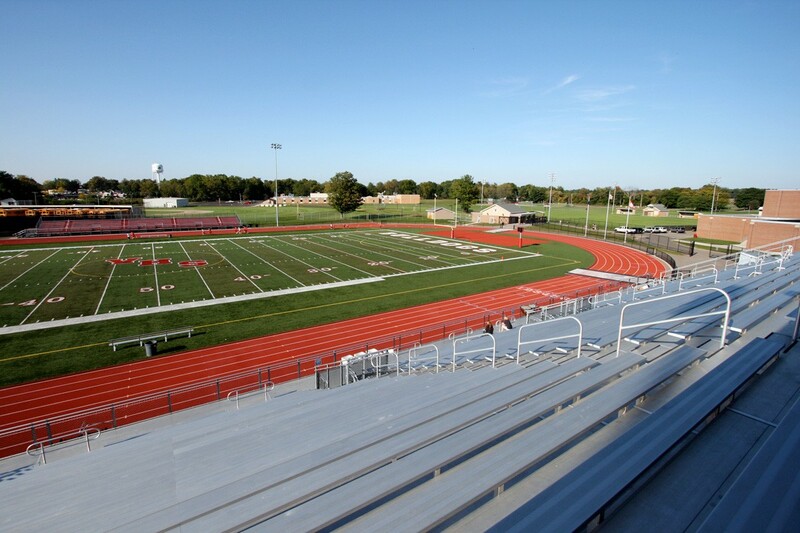 The athletic complex features a synthetic turf field and a resilient-surface track. This allows other sports teams (i.e. soccer) to use the field for games and practice, maximizing field use. The complex also includes new ball fields and tennis courts. TowerPinkster performed a district-wide facility assessment, which allowed the district to conclude that the best possible outcome for the elementary program would be to demolish the lower elementary building, and renovate and expand the Velma Matson building to house the entire program. The outcome is optimized learning spaces that use creative strategies for useful space while minimizing inefficient building areas. Safe building techniques were implemented to control access to and from the facility throughout the day. Technology-rich learning centers compliment modern teaching styles and student learning opportunities. 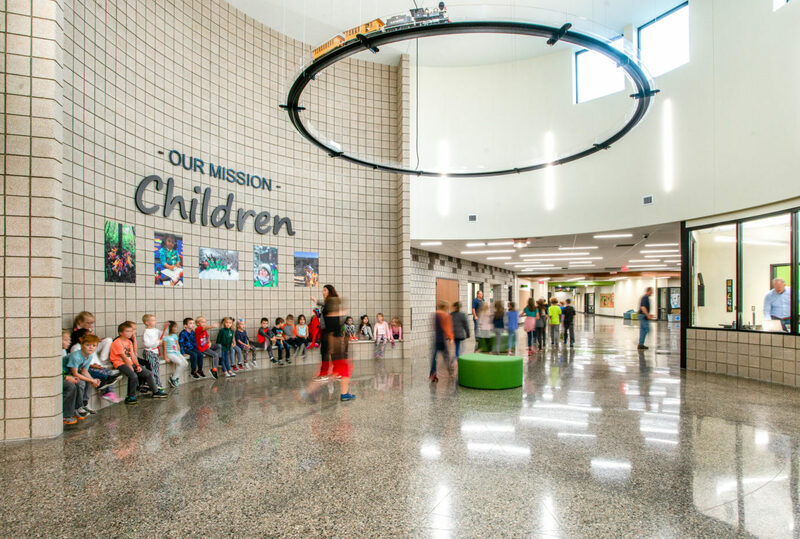 Kalamazoo Christian's Elementary School currently served preschool through fifth grade, and TowerPinkster designed a Middle School addition which would relocate sixth through eighth-grade students from their current facility. The addition features an art room, choir room, multipurpose/music space, a conference area for staff, and three dedicated classrooms for each grade. The design also accommodates future expansion for a gymnasium addition. Milwood Elementary was in need of updates to improve the educational environment and provide classroom space similar to other recently completed projects within the Kalamazoo Public Schools (KPS) district. 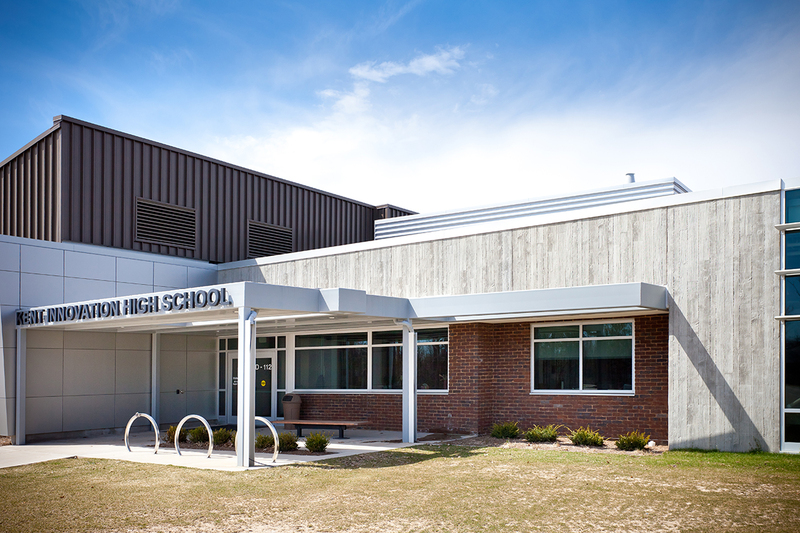 TowerPinkster collaborated with KPS in order to complete two additions and renovations to the building. In order to give Kelloggsville students all available opportunities to prepare them for their futures, the high school space needed to be renovated to accommodate the competitive nature of today’s learning environment. 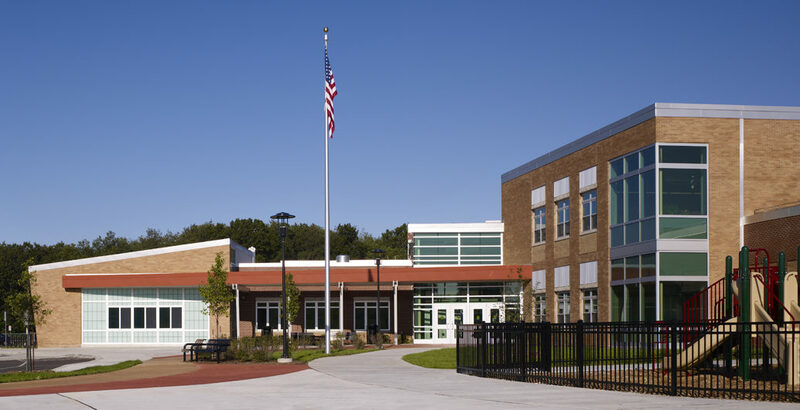 This development included adding a gymnasium, track, and media center on an extremely restricted site, while completely updating the rest of the school to meet modern learning standards. The highly visible location of the Immaculate Conception Elementary School on the main artery into downtown Traverse City provides a wonderful opportunity to improve the presence of the Church and school within the community. TowerPinkster’s design solution created a new “Main Street” through the center of the building to improve circulation, visibility, and supervision. Art rooms and a multi-media lab are visible from Main Street and a new, modern media center (which serves as the community library) was relocated from the center of the building to a more visible location, allowing for easy community access. The 40-year-old auditorium was replaced with a new 800-seat auditorium which boasts flexible seating arrangements. The new facility features a two-story commons that serves as the unifying space between three zones: academics, fine arts, and athletics. The Commons Area is multi-functional and combines spaces for study, dining, project areas, and casual interaction. TowerPinkster also designed a new stadium entry, concessions, team rooms, and new press box. The athletic complex features a multi-use synthetic turf field and resilient-surface track, as well as new ball fields and tennis courts. 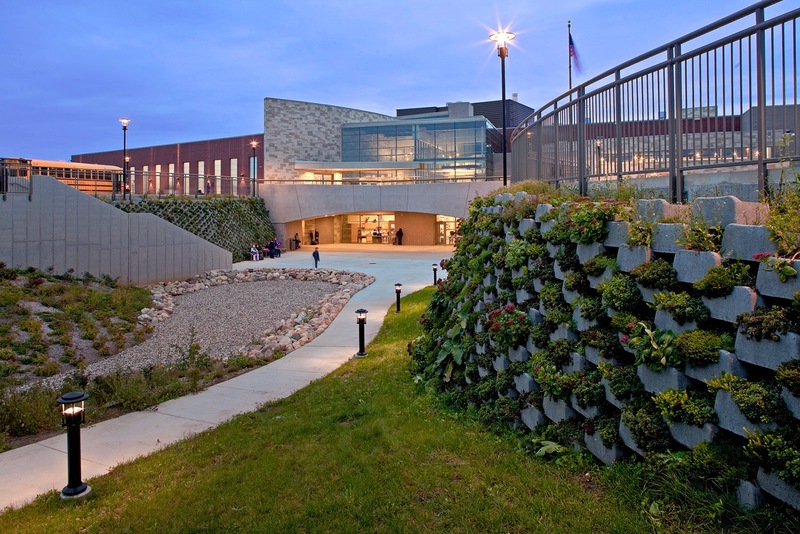 Cost-effective and creative solutions were designed to address Shepherd’s facility challenges. At the elementary, 16 new classrooms replace portables, the existing gym was renovated into a media center which better serves students and the community, and a new gym/cafeteria was designed as a more economical solution. 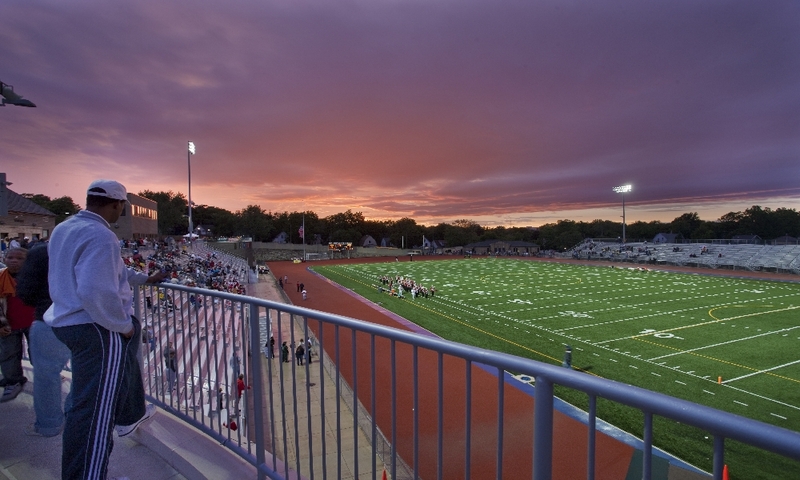 The existing athletic stadium at Olivet High School consisted of a natural grass field with an asphalt track, located in a low, wet area with frequent flooding. The facility was also too small for attendance. By stretching the office and band/choir addition across the front facade of the building, TowerPinkster created a new image for the high school. This addition provided a new office area and a secure point of entry. Additionally, the design team reworked the core of the building by carving out additional space for a new, larger auditorium and new cafeteria. The auditorium contains custom moving and rotating acoustical panels which allow the space to accommodate both theatrical and musical performances. 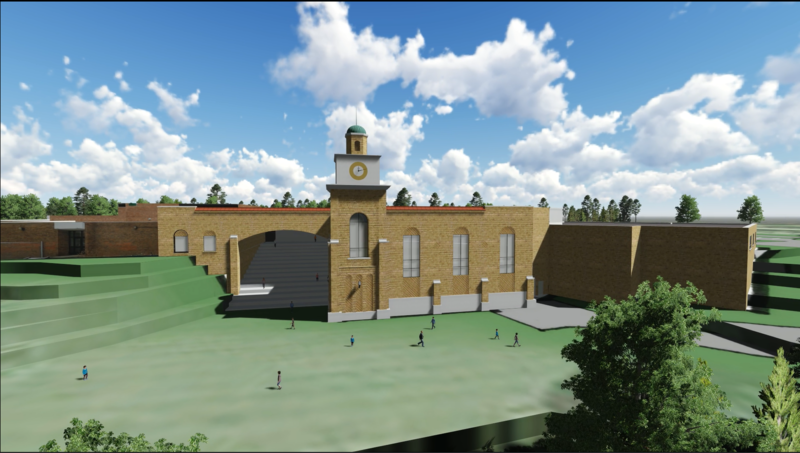 TowerPinkster redesigned this athletic complex, originally built on swamp land, to address drainage issues. 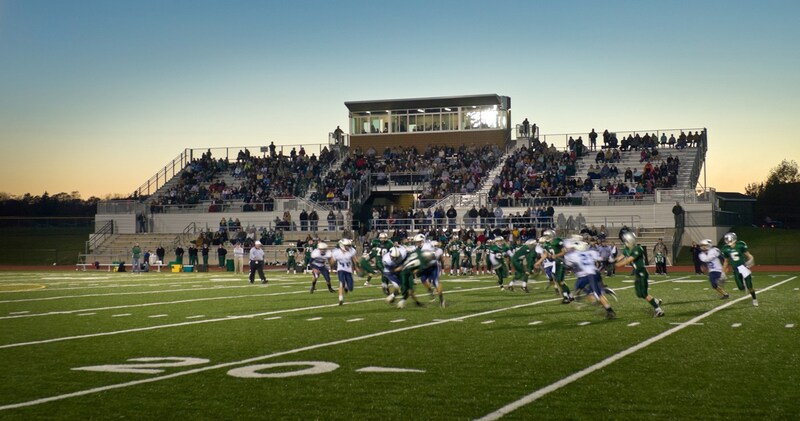 Synthetic turf was used to provide the district with more opportunities to utilize the stadium for practice fields, soccer, rocket football, physical education classes and bi-weekly band practices. A new entry was also created, along with visitors’ and home concessions and a locker room that also serves the adjacent tennis courts.